Without wanting to sound repetitive (and in so, doing) I could definitely be a fully signed up member of the Pescatarian club if it was not for the occasional craving for somewhat beefier fare. In an average week, I probably have fish/seafood of some form around 3 times per week. For me, the two main reasons are obvious. I love the flavour, and the recipes I make are so quick and easy to cobble together. Whilst prawns are ubiquitous (and I have no issue with buying frozen), squid can be a harder find. Even though there is a really amazing covered market in Leeds a few miles away from where I live, I am not too keen in the height of summer (or our version of it) and lug back what was formally fresh seafood on ice. I do, sadly, rely on Supermarkets for the bulk of the food I buy as sadly most independent stores are sadly long gone. On occasion, I have found frozen whole squid which has been prepared, with the tentacles conveniently stored inside the body. I much prefer this option to finding the squid chopped up into rings. It spoils the fun of preparing it entirely. Don’t worry if you have any leftovers, it will reheat really easily and last for a couple of days in the fridge. The best way to tackle this recipe is to prepare everything in advance. Get you chopping, slicing, and crushing out of the way, and the rest is really quick and easy. First, bring a large pan of slightly salted water to the boil, and cook as per the packet's instructions. If you are using fresh pasta, you may want to cook the pasta towards the end of the recipe. Heat up the half the olive oil in a large pan, and gently cook the red onion, garlic, lemon zest and red chilli on a medium heat for 2-3 minutes. Then, add the cherry tomatoes ( flat face down) and rosemary sprigs,and cook for a further 2-3 minutes until the tomatoes have started to soften. Reduce the heat by a notch, and add the tiger prawns they will start to go pink quite quickly. Make sure that you turn them regularly so that they are evenly cooked. 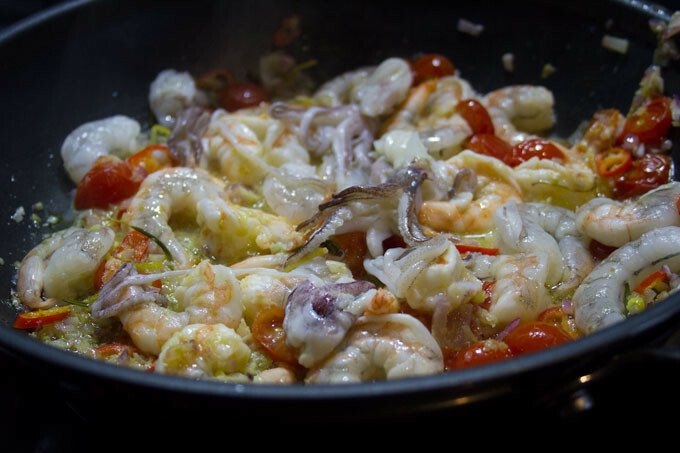 Next, add the squid pieces and stir gently for a further 3-4 minutes until the prawns have adopted a slightly rosier complexion all around. Add the white wine, cream (optional), and lemon juice and bring to the boil. Then, season with sea salt and freshly ground black pepper. Reduce heat, and simmer for a further 2-3 minutes until you are ready to serve. Add the desired quantity of pasta to a warm pasta bowl, and spoon over some of the juices. Then, layer over the pasta an even mix of prawns,squid, and tomato. Don't worry if you do not have any Fusilli pasta. I am sure it'll work well with pretty much what you have lurking in the store cupboard. I made this tonight and it was delicious. 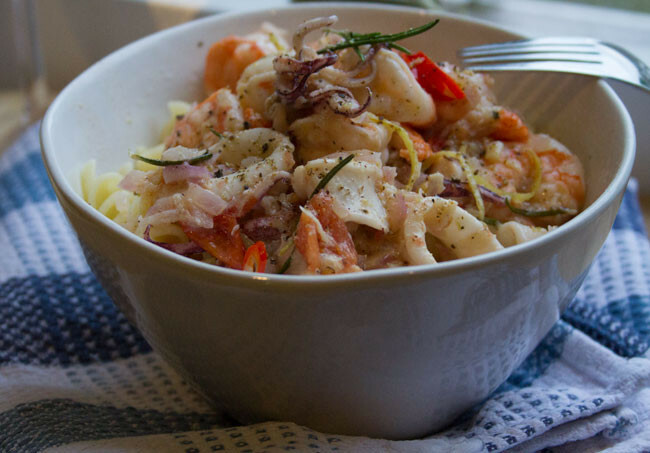 Used precooked seafood from the shops which worked quite well and think that the addition of mussels was nice.